Last year when my sweet friend Homeyra gave me her delicious recipe for Salad Shirazi, she also gave me a second Shirazi recipe. I never got around to cook and post the second recipe she gave me. I can’t believe all this time has gone by, but today is the day!! I present to you Koofteh Hulu. Translated it literally means Peach Meatball. The are no plums in this recipe and the meatballs and the mention of the plums simply represents the size and form the meatballs should be. I think I got over excited when making these because I made the meatballs a bit bigger than they should be. In my head I was imagining the delicious huge plums that we usually get from the Torrance Farmer’s Market. Anyway, regardless, they are simply delicious!! A bit on the sweet side but once you add some lime juice it all turns into a delicious combination of sweet and tart!!! As I said in my last post, Homeyra rocks when it comes to giving recipes. There is no guess factor as far as the amount of ingredients go and a need for me to make the recipe a couple of times in order to get the ratios right. Small dice one of the onions and saute in some oil. In the mean time take all baby carrots for the exception of 10 and grate. 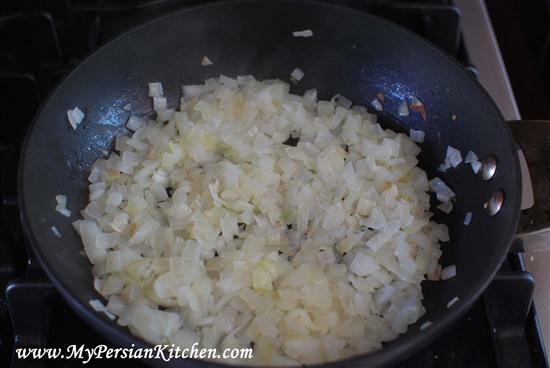 Once the onion has turned nice and golden add raisins, a pinch of salt and give it a stir and saute for a few minutes longer. Set aside and allow to cool down a bit. In the mean time grate the second onion. 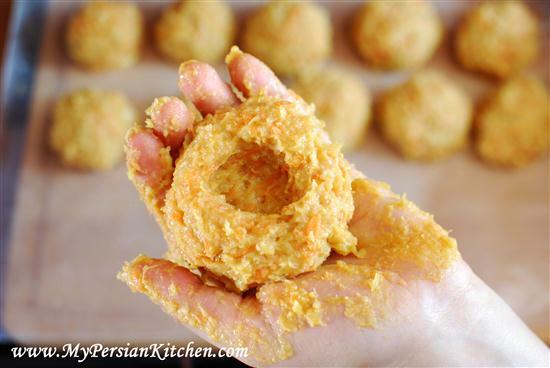 In a food processor or bowl mix together grated onion, turmeric, chickpea flour, egg and some salt. Pulse a few times. 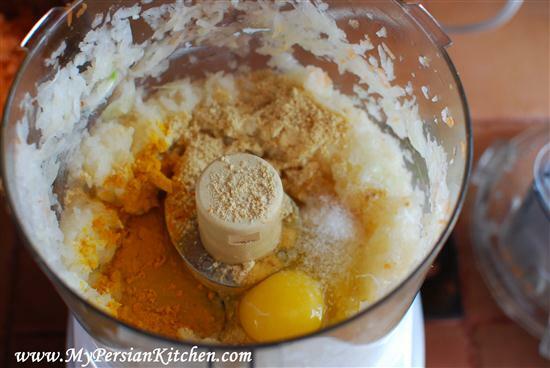 Add meat and pulse so that the mixture is nicely combined. 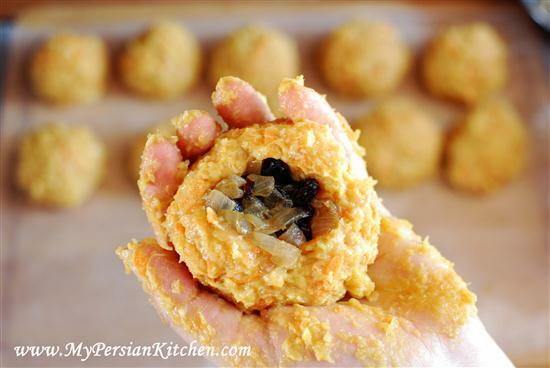 If it is too sticky add a bit more of the chickpea flour. 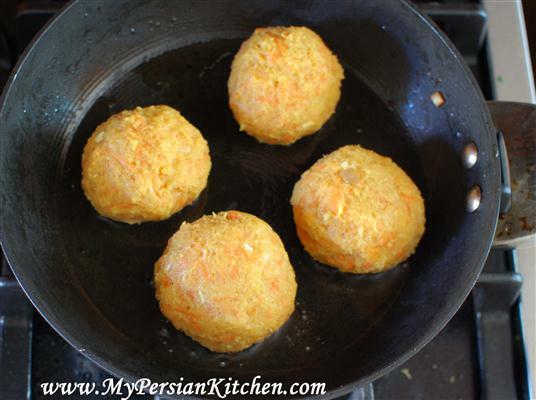 Take enough of the meat mixture to make a meatball the size of a plum. With your fingers create a hole in the middle of it. Place a couple of teaspoons of the onion and raisin. Carefully seal the hole. Line up the meatballs on a wax paper. I was able to make 12 meatballs. Place 3 cups of water along with sugar and 1 tbsp of salt in a pot. 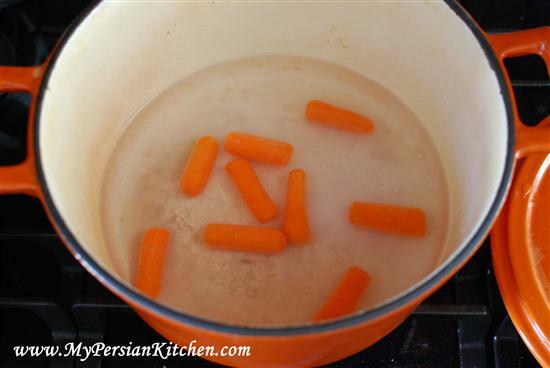 Add carrots and bring to a boil. In the mean time lightly brown each meatball in a pan timing it just right so that once the water starts boiling you can add the meatballs to it. 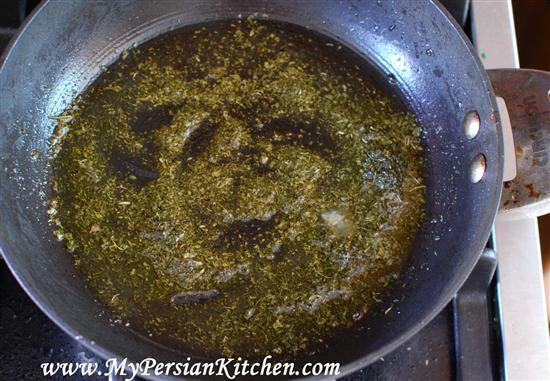 Once all the meatballs have been browned add 1 tablespoon of oil to the same pan along with with mint and allow the oil to be infused with the mint. We call this Nanaw Dagh, which literally means hot mint. 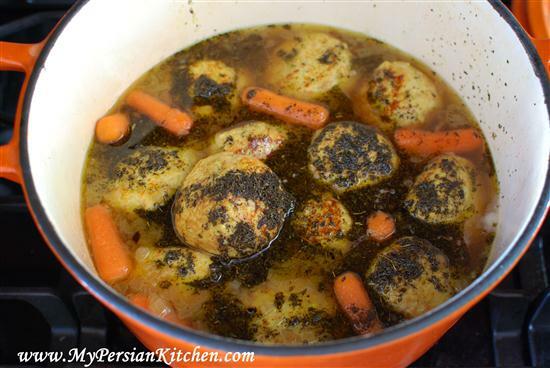 Pour the oil and mint over each meatball. 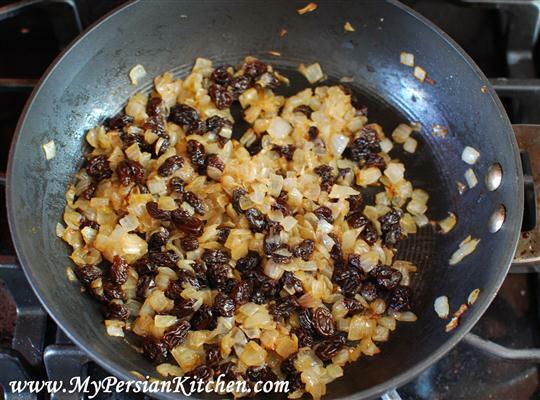 Add any leftover raisins and onion to the pot as well. Cover and simmer for half hour. 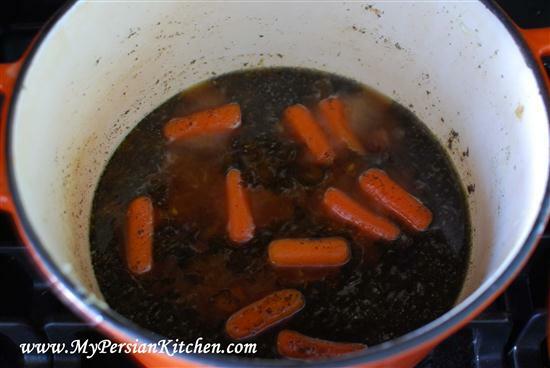 Add lime juice and cook for about 5 to 10 minutes longer. 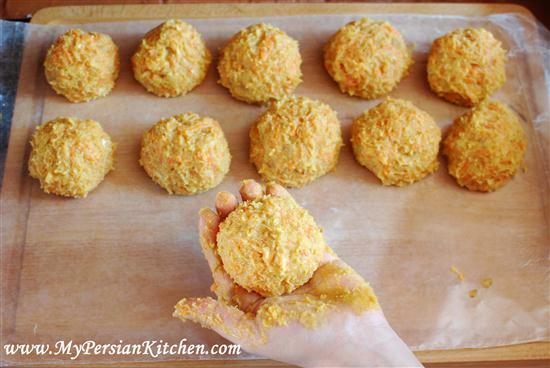 Remove meatballs and place in a platter. 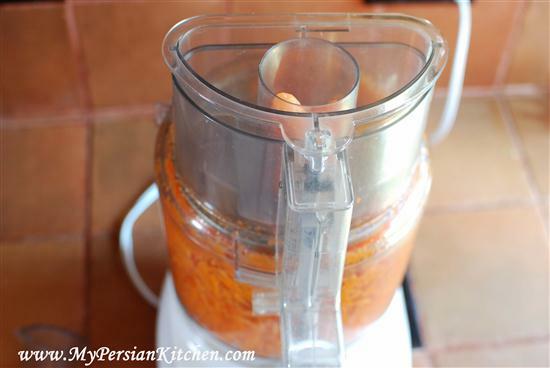 If there is too much juice leftover then add 1 tablespoon of regular flour or chickpea flour and allow to thicken. Pour juices over the meatballs. 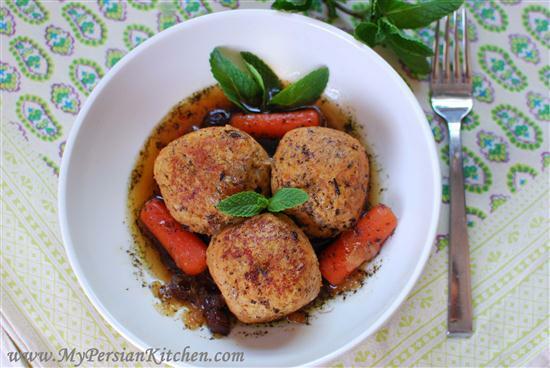 Homeyra says to serve these delicious Koofteh Hulu with Sabzi, fresh herbs! All I have to say is that my kitchen smelled divine and that I could not wait to be done with the final picture taking process and sink my teeth in that plate of meatballs!!!!!!!!!!!!!!!!!!!!!!!!!!!!! Please send me one of them to taste it. I just wanted to let you know that I’ve made koofteh hulu yesterday. Thanks for the great recipe and for the nice anecdote about your friend who grew up in Italy, I laughed a lot. Wow! We just finished eating the kooftehs and they turned out fantastic. I love the combination of sweet, sour and mint and my wife loved the raisin surprise. Thanks for the recipe. 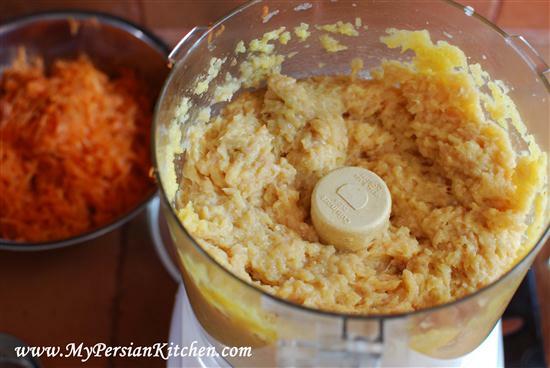 One question though – when was I supposed to add the grated carrots? I just added them to the ground turkey mix. Also, do you always make the kooftehs with a sweet sauce? My wife thought that a butternut squash / pumpkin soup would be also interesting. What do you think? Hulu means peach not plum. In which case you got the size right. These look great and I’m sure they are tasty as well. I can’t wait to make them. I am a big fan of your blog and I’ve been looking for a koofteh hulu recipe and yours was the only one on google! Not exactly like my family does it though, here is our way of doing it, unfortunately in Swedish! Thank you so very much.m My mom used to make the Kofteh Hulu, I google it to see if I can find a recipi for it, surprisingly Voila!!!…. I just made it using your recipie , I am not a good cook but it came out as delicious as my mom’s!!!….. Thank you so very much. My Mom used to make the Kofteh Hulu, I google it to see if I can find a recipe for it, surprisingly Voila!!!…. I just made it using your recipie , I am not a good cook but it came out as delicious as my Mom’s!! !…..